Pool shock is a great tool for keeping your pool’s chemistry balanced, and it is the best way to eliminate algae and return you water to pristine condition. When done at a regular frequency during the summer and high bather load months it is also a helpful and proactive way to retain a minimal level of chemical exposure to you, your family and, if you are a commercial facility, your staff and patrons. The term “shock” is an expression used in the pool industry to describe the intentional over-chlorination (or over-oxidation) of the pool water chemistry for a calculated period of time. Chlorine at normal residual levels is consumed by organic material (oils, lotions, urine and algae) in the water. Shocking (continual addition of chlorine beyond normal levels) a pool allows the elevated levels of chlorine to reach a breakpoint where the organic materials’ demand for chlorine has been satisfied. Once the chlorine has reached this level, combined chlorine is lowered and nuisance algae is eliminated. There are two main types of chlorine pool shock that are used in both the residential and commercial pool environment. Note that some have cyanuric acid and some do not. There is also a non-chlorine shock available. 1. Calcium Hypochlorite: Also common known as “cal hypo,” this shock is the most powerful and fastest acting shock available. Both an oxidizer and sanitizer, cal hypo is quick dissolving and is the most frequently used in the pool industry. It will slightly raise your pH, so make sure you adjust pH while using it. As the name implies, it will also raise your calcium hardness levels in your pool slightly. It is sold in granular or in pucks/tablets. A close relative of calcium hypochlorite is sodium hypochlorite, commonly known as bleach. 2. Dichloroisocyanuric Acid: Also known as “dichlor,” this is another type of chlorine shock. Dichlor contains both chlorine and cyanuric acid and will, over time, raise your cyanuric acid levels. For more information on cyanuric acid, please see our blog post Cyanuric Acid: Friend or Foe. Like cal hypo is it both a sanitizer and an oxidizer, can be purchased in granular or puck form and will slightly lower pool pH. 3. 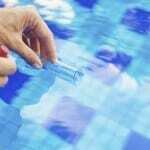 Sodium Monopersulfate: Also known in the pool industry as MPS shock, this shock is an alternative to chlorine shock. MPS is an oxidizer but not a sanitizer. It will remove organic material from the water and will eliminate waste in the water without the unpleasant side effects of chlorine. There are plenty of reasons to shock your pool. According to NSPI/APSP standards, the ideal frequency for a brief super dose of shock is every week, depending on use and water temperature. Proper shocking of your pool will help mediate the need to shock more frequently and will perform a more complete cleaning of your pool water chemistry. Without getting into the heavy science, it takes a certain level of chlorine to reach a breakpoint where chloramines are released from the water. If this breakpoint is not achieved, these odorous chloramines will persist in your pool resulting in an incomplete shock. Take in account whether cyanuric acid is in the water when calculating how much shock you will need. With increased levels cyanuric acid, you will have to use more shock to reach the critical breakpoint. A reasonable estimation for great results from shock is to bring the free chlorine to 40 percent of the cyanuric acid level in your pool. For example, if you have 50 ppm of cyanuric acid in your water, shock to a free chlorine concentration of 20 ppm. It is also critical that pH is maintained through the process of shocking. The ability of chlorine to work effectively is directly proportional to the pH. When the pH is out of range, pool shock will decrease its effectiveness significantly. When shocking your pool with a Clear Comfort system it is important to understand when and how much shock you will need to use for best results. It is also important to know when your pool is chlorine free and safe to swim. Only shock the pool as needed – this will be the case during the hot summer months or during periods of high use. During winter months or low bather load periods, the Clear Comfort system alone will keep your pool clear and clean without shock. Only shock at dusk or night and leave the cover off. Ensure your pH is in the appropriate range of 7.2-7.4. It is important to run pump and filter the water for one hour after shocking the pool and vacuum the debris that falls to the pool floor after the shock the following morning. 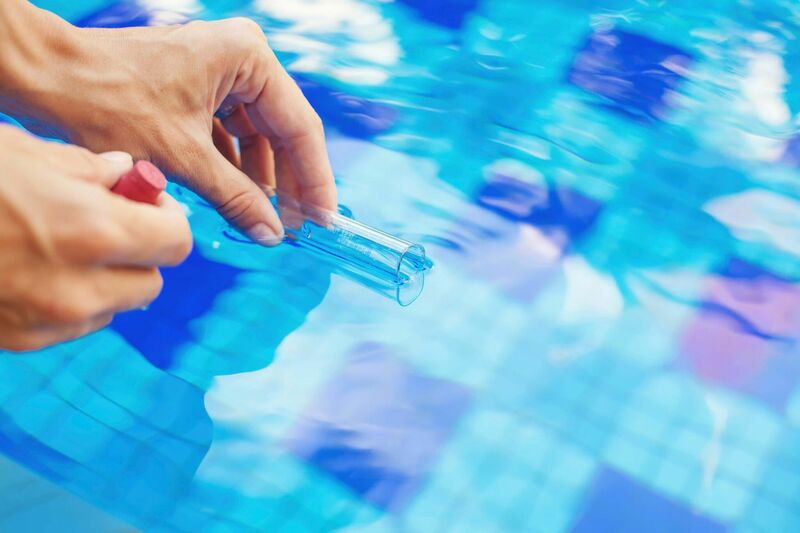 For residential pools, measure the cyanuric acid level prior to shocking your pool as cyanuric acid will hold onto the chlorine delivered by shock. Add chlorine shock, in the form of calcium hypochlorite or bleach, and allow chlorine to dissipate overnight while no one is swimming. By morning, chlorine will be gone allowing you to swim in a chlorine free pool. This can only be achieved with little or no cyanuric acid in the water. High levels of cyanuric acid will not allow for chlorine levels to quickly dissipate back to zero. If there is a high level of cyanuric acid in the pool water (greater than 20 ppm), use sodium monopersulfate as the shock of choice. For commercial pools, where chlorine is required by code, ensure that the cyanuric acid is no more than 50 ppm and shock as needed. Sodium monopersulfate can also be used as shock. Trichloride.” (2009). Web. 26 Jan. 2016. Kott, Y., E. M. Nupen, and W. R. Ross. “The effect of pH on the efficiency of chlorine disinfection and virus enumeration.” Water Research 9.10 (1975): 869-872. O’Brien, J. E., J. C. Morris, and J. N. Butler. “Equilibria in aqueous solutions of chlorinated isocyanurate.” Symposium on the Chemistry of Water Supply, Treatment, & Distribution. 1974. Wojtowicz, John A. “Effect of cyanuric acid on swimming pool maintenance.” Journal of the Swimming Pool and Spa Industry 5.1 (2004): 15-19. Nick is an accomplished microbiologist with more than 10 years of experience in emerging water technologies, industrial microbiology and commercialization of public/private ventures. In addition, he is the author of multiple patents and led microbial bio prospecting expeditions in extreme environments. A frequent speaker in the pool industry and the university technology and startup accelerator spheres, he is a thought leader in several areas of the water energy nexus and business strategy. Nick holds a BS in Microbiology from the Colorado State University and is fluent in English and Spanish.